I’ve been making grand plans for slightly ridiculous and big changes in our living/bedroom. I’ve been wracking my brain for creative furniture arrangements to maximize space and function. Many furniture pieces have made a grand appearance in our house only to make a quick exit because of size, color, shape, or my sometimes fickle design tastes. Even though many new pieces have made an entrance, they’ve been scored for low prices and took some creativity to suit our home just the way we want them to. I thought I would share some of my favorite pieces I’ve scored recently. The flooring in our house is quite old, ancient really, and pretty darn ugly. 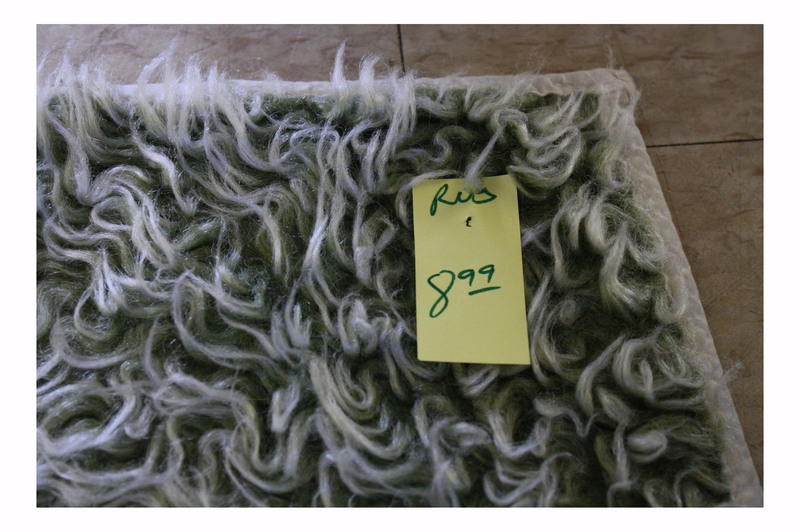 Even though I love putting paint on the walls and spending some dough on furniture, I have to draw the line at replacing the floor in a rental, so we have to make due with some area rugs. 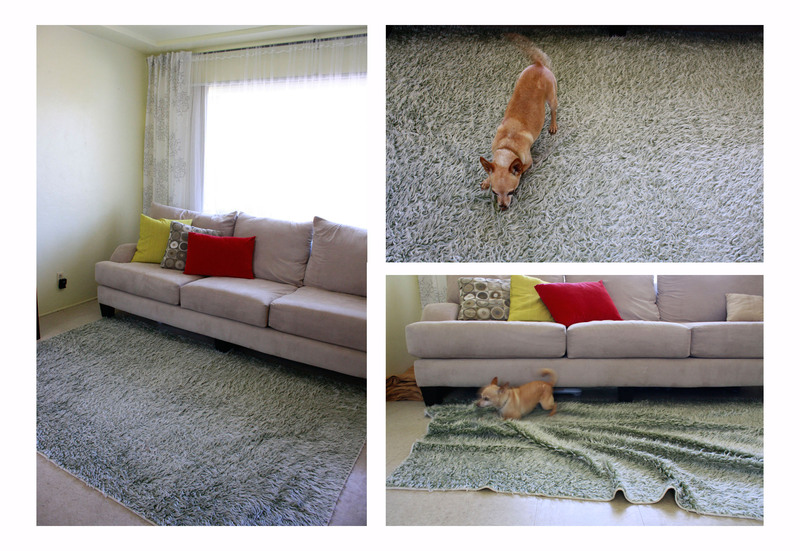 So check out this shagadelic rug I picked up at the thrift store around the corner from our house. It was priced at a whopping $8.99, I figured for that price I could give it a try in our house and see if it was totally radical or a complete disaster. I was recently admiring a vase on this coffee table over at Young House Love, and wanted to find something in similar size and texture for our table. Isn’t their living room gorgeous? So I perused the glassware section at the thrift store without any real expectation of finding something, when I spotted this vase for $12.99. 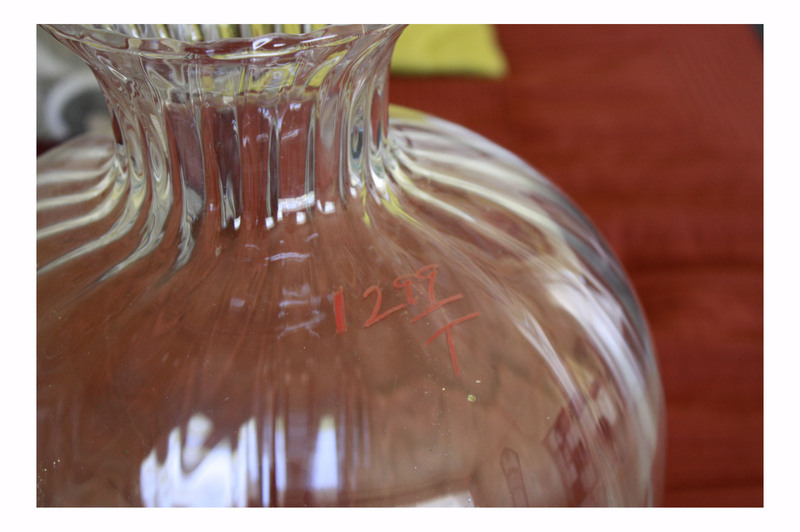 I was hesitant to spend the full price but knew that it was a really great deal for such a large vase and figured I could splurge a bit…. When I got to the register I asked the woman if there was any price negotiation on home décor items, I figured it couldn’t hurt to ask! She said no. Then the sweet woman said the magic words, “It’s labeled with a ‘T’, which means it is color coded ‘tan’, which happens to be 75% off”. I paid a whole $3.25 for this beauty. Score! 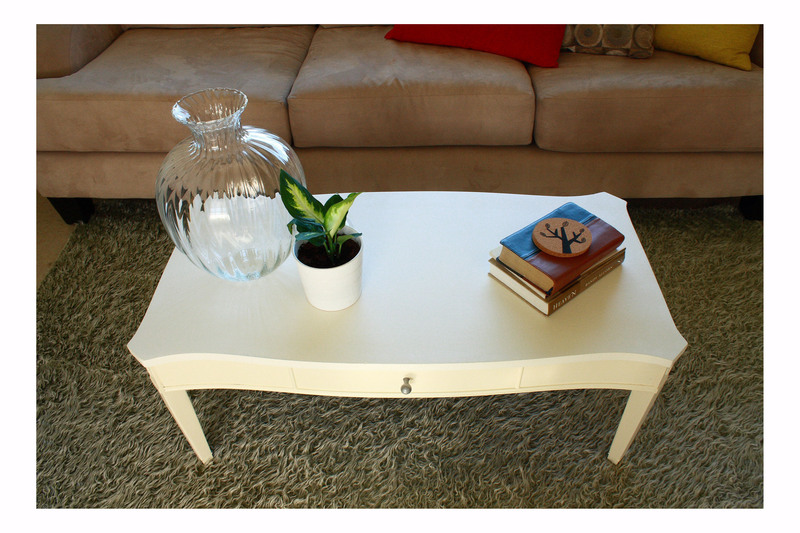 Isn’t the vase lovely on my refinished coffee table and thrifty nifty rug? The entire look cost me all of $29.54. Not too shabby I’d say…. So are there any thrifty finds you’ve managed to nab recently? Feel free to share photos! Oh I’d love to see what you painted :) What did you paint on the canvases? Invite me over for tea as I’d love to see your place! A little bird told me you were going to attempt the plaster paint treatment! I’d love to see it finished! I’m hoping my projects will inspire other people to give it a try! hehe you think you’re funny huh babe :). I have the BEST hubby!